Welcome to our workshop exploring the art of paper cutting. In October, artist Maude White introduces the intricate, meditative practice of building cut paper art and we can't wait to share it with you! We invite you to explore Maude's visual portfolio of work on Instagram to see all of the possibilities this technique implores. For this particular workshop we'll be focusing on three templates that range from beginner to advanced paper slicing as well as observational creation from the world around you. The ancient art of paper cutting is practiced around the world. It first originated in the 4th century in China during the Han Dynasty. In the 13th century it came to Europe via Germany and Switzerland with folded scherenschnitte and silhouette art. In Japan, people create kirigami, which is cut and folded paper art. In Mexico, people create papel picado, which is folded colored tissue paper that is cut with scissors. 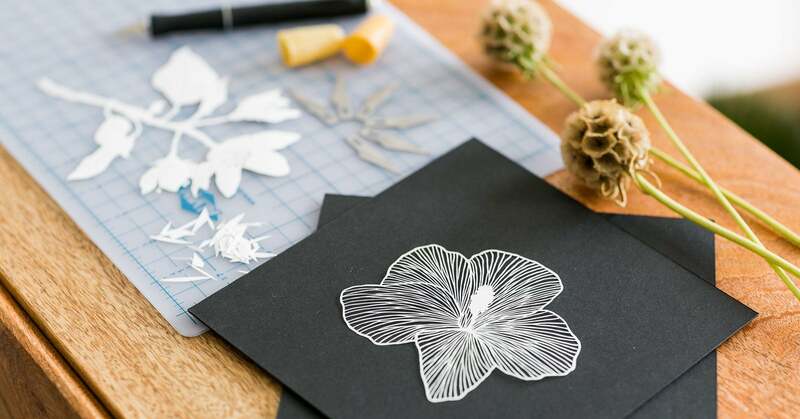 A beautiful aspect to paper cutting is that paper is everywhere, all over the world, and so many richly diverse cultures have their own paper cutting traditions. Maude's workshop varies from these historical techniques by utilizing a very sharp blade held much like a pencil or paint brush to execute finite cuts to ultimately create positive and negative space. We've built a workshop sharing exactly how to accomplish the drafting of and progress of this beautiful art to share with you. Maude is an award-winning cut paper artist and writer from the Hudson Valley, New York. She is the author of Brave Birds Inspiration on the Wing (Abrams 2018), and the illustrator of Leading with Love Inspiration for Spiritual Activists (Parallax 2018). In film, her shadow puppet designs appear in The Happy Film documentary by the internationally acclaimed graphic designer and typographer Stefan Sagmeister. Her work has been featured in The Artist Magazine, Art House Press, Orion Magazine, and The Public, among others, and has been exhibited in national and international galleries. We can’t wait to see how you are inspired to create using this new technique! Be sure to share with us by tagging @bymaudewhite and using #thecraftersbox. Happy making with this special workshop.